Yesterday, I started in reading the first in the series of books I've lined up as background work for my next writing project. The project...an exploration of the interface between M-Theory and Christian faith...has a deliciously windmill-tilty feel about it. Nothing like writing about a topic that no other Christian seems to care about to ramp up the book sales, eh? Still, I've got this gut sense it's a fascinating topic to explore. If I'm going to explore the science of it, though, I'm operating under some significant limitations. First and foremost, I'm not a scientist, nor do I play one on TV. Feigning expertise in this area would be a fools errand. Equally foolish would be trying to start a second career as a physicist. There's just not enough free drive space in my cerebellum to attempt that. What is worth doing, though, is reading through some of the lay-accessible literature on M-Theory cosmology. These are works written by folks with scientific street cred, but who are trying to interpret and present the results of quantum, string, and M-Theory for bright-eyed Neanderthals like myself. In the absence of the late lamented Carl Sagan, there are still plenty of folks out there interpreting for the laity. First among the works I'm perusing is Parallel Worlds, a book by Michio Kaku, a theoretical physicist at CUNY. It's a good accessible read, and one that seems even within the first few pages to point strongly to a creative tension between M-Theory and faith. 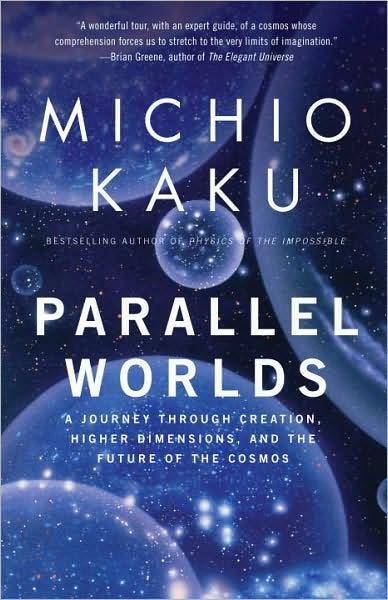 Kaku begins with noting the tension between our linear, temporal, and changing spacetime...with a beginning and an end...and the idea of the eternal and unchanging. The great narrative arc of Genesis and Creation seems to stand separate from the concept of God the Impassible and Eternal. Not being a theologian, Kaku assumes that this is a tension that only exists if you contrast the Judeo-Christian narrative to the Buddhist understanding of Nirvana. Honestly, though, it's a tension that exists within Christian faith. How can God be unchanging, and still be the God of Love? How can we who are endless change stand in relationship with the I AM THAT I AM? It's also a dialectic that exists within classical philosophy at it's most primal level. The argument between proponents of being and prophets of change has been going on since Parmenides and Heraclitus had at it in Fifth Century Elea. That's Fifth Century Bee See Eee, folks. What is gradually emerging from the data is a grand synthesis of these two opposing mythologies. Perhaps, scientists speculate, Genesis occurs repeatedly in a timeless ocean of Nirvana. Not just scientists, eh? I'm looking forward to reading more of Kaku.